What do antiques, time, and gold have in common? They are costly, due either to their original cost or the improbability of their history, and it is difficult to spoof this costliness. For example, it is usually difficult to spend an extra hour at the office without sacrificing about an hour of your personal life. Unforgeable costliness is a pattern that recurs in many human institutions and is fundamental to civilization. Modern employment is based on the time-rate wage. Our monetary system is based on money being made unforgeably costly either through collectibles, commodity standards, or (in modern fiat currencies) accounting. (1) find or create a class of objects that is highly improbable, takes much effort to make, or both, and such that the measure of their costliness can be verified by other parties. There are some problems involved with implementing unforgeable costliness on a computer. If such problems can be overcome, we can achieve bit gold. This would be the first online currency based on highly distributed trust and unforgeable costliness rather than trust in a single entity and traditional accounting controls. Hal Finney has implemented a variant of bit gold based on a tamper-evident computer plug-in card, for which remote users can verify what code is running on the card. Abstract money today primarily involves accounts and other computerized bits, but traditionally came in the form of paper. The Chinese, who invented paper money called it "flying money." Abstract money is worthwhile because the dominant kind of money over human evolution, unforgeably costly commodities, can be quite costly to store and transport compared to abstract documents. For money the biggest costs of storage and transportation are typically not mundane real estate or carriage costs, but active security threats such as robbery and embezzlement. Abstract documents, unlike unforgeably costly commodities, require trust in a human institution to enforce the abstract claims of value made in the document. This enforcement, if effective, lets the recipient of the document be confident that it can be converted into something of value, traditionally an unforgeably costly commodity that backs the document. If the recipient of the document wants to trade the document to third parties -- negotiate it -- this enforcement may also provide confidence to these third parties that they too can receive something of value in exchange for relinquishing the abstract claim. Enforcement typically came in the form of legal and reputation systems. For example, the Medieval European law merchant enforced contracts and monetary promises in the merchants' own courts, with remedies such as bankruptcy and expulsion from merchant guilds. Bosses (principals) enforced orders against their employees (agents), and there were also often family relationships within firms that increased trust within the firm. In most modern legal systems, and in many traditional legal and merchant reputation systems, credit money has come in two basic forms -- drafts, or orders from a boss to his employee (in legal jargon, from a principal to his agent) to transfer goods to a certain person, and notes, or promises to transfer goods to a certain person. A draft was enforced privately, by the ways bosses normally discipline employees; a promise to pay was enforced by an enforcement agency, often a government, by reputation among merchants, or both. Often the document reifying money that we will examine took on both of these roles. The draft, in particular the warehouse receipt, is probably oldest form of credit document. Warehouse receipts are issued to document the storage of personal property in a warehouse. Typically, a warehouse receipt is an acknowledgement that the warehouseman is holding the owner's goods. The receipt acts as a title to the goods; transferring the receipt is as good as transferring the goods. The receipt acts as an instruction to the warehouseman's agent to release the goods to whoever presents the receipt. Thus, it is more properly categorized as a draft (an order to an agent) than a note (a promise to pay), although in some ways and in some legal systems it has been treated as both. Another kind of draft is a bill of lading. This is a receipt for transported goods, and an order for the transport agent at the other end to release the goods to a person authorized by the shipper to receive them. Description of illustrations(in order): Sumerican clay envelope c. 3,500 B.C., probably a warehouse receipt or a billing of lading; plate for Chinese paper money, c. 1279 A.D., with recent print from that plate; private bank note of the Bank of Scotland, 1716; Early Mormon private bank (Kirkland Safety Society, Ohio, U.S.A.) note signed by Joseph Smith, 1837; private bank note from a private road and bridge operating company (Delaware Bridge Company, New Jersey, U.S.A.) 1838; warehouse receipt for silver with micro-barcodes 2002. If a loan was taken out to buy that car, and the owner failed to make payments, the smart contract could automatically invoke a lien, which returns control of the car keys to the bank. This smart lien might be much cheaper and more effective than a repo man. Starter-interrupt devices are becoming a popular way for lenders to ensure they get paid, and consumers seem willing to accept them to get into nicer cars, use a smaller down payment and qualify for a lower interest rate, according to device manufacturers. ...The companies make a variation of the same device: The units are connected to the starter and emit a brief series of sounds or flashes of light, days before the payment deadline. If the customer then makes a timely payment, he or she can contact the dealer for a new code that will allow them to operate the vehicle. Some devices are remotely controlled by dealers. Note that the process is far more manual and that there is much more attention to the user interface than I was thinking about in 1994. It's becoming increasingly apparent that a good user interface is often key to good security (phishing is another big example of this). Contracts are ultimately relationships between people, so a smart contract protocol needs to go all the way from end to end -- from person to person. Furthermore, as long as the parties have access to a good legal system, making certain important steps manual is a good idea if it increases flexibility and safety without too substantially decreasing security or user friendliness. My thanks to Ian Grigg for pointing me to Yao's article. There's a strong distinction to be made between "wet code," interpreted by the brain, and "dry code," interpreted by computers. Human-read media is wet code whereas computer code and computer-readable files (to the extent a computer deals meaningfully with them) are "dry code." Law is wet code, interpreted by those on whom the law is imposed, and interpreted (often somewhat differently) by law enforcers, but most authoritatively (and even more differently) interpreted by judges. Human language is mostly wet code but to the extent computer programs crudely translate from one language to another, keyword-ad programs parse text to made an educated guess as to what ads a user will most likely click, and so on, human language text can also be dry code. Traditional contracts are wet code whereas smart contracts are mostly dry code. Secure property titles and the domain name system are mostly dry code. Even "mostly dry code" often has surprisingly soggy portions. Smart contracts, for example, can use dialogs to communicate their nature to the user and to allow the user to at least input some parameters, make menu choices, and the like. These are cognitive channels that translate between wet code and dry code. Similarly, the human-readable name in the domain name system is wet code and trademark law is wet code that applies to domain names. Phishing is an attack against cognitive channels using ambiguous wet code, which is probably why dry code programmers have a hard time coming to grips with it. The syntactic properties of wet and dry code are often very similar -- for example, both human and computer language can usually be parsed by pushdown automata into context-free grammars. But their semantic content is often radically different, and the semantic content of wet code is often simply unintelligible to a computer, for a variety of often mysterious reasons. If we had good enough theories of human semantics we could program such theories into the computer and the computer would then understand like a brain after all. But we don't, in most areas, so we mostly can't program computers to emulate humans. I believe these mysteries are primarily due to the highly evolved nature of the brain contrasted to the recent and thus naive designs of computers, especially with respect to computers' typical lack of good sensors (they're mostly still far more sensory-deprived than Helen Keller, who had a very informative sense of touch) and relative inability to learn from natural and social environments. Their ability to aggregate disparate kinds of information, for example through conceptual metaphor, is also relatively undeveloped. As computers become "smarter" dry code is (very slowly) coming to do more that was formerly only done by wet code. Once it successfully emulates wet code it soon surpasses it in many respects; for example by now dry code can do simple arithmetic billions of times faster than the typical human. As the idea of smart contracts suggests, there are many fruitful analogies to be made from wet code to dry code, but we must keep in mind the radically different semantics, the strengths and weakness of each, and the need for each to interact with the other to solve real problems. I don't think there is a "magic bullet" theory of artificial intelligence that will uncover the semantic mysteries and give computers intelligence in one fell swoop. I don't think that computers will mysteriously "wake up" one day in some magic transition from zombie to qualia. (I basically agree with Daniel Dennett in this respect). Instead, we will continue to chip away at formalizing human intelligence, a few "bits" at a time, and will never reach a "singularity" where all of a sudden we one day way wake up and realize computers have surpassed us. Instead, there will be numerous "micro-runaways" for particular narrow abilities that we learn how to teach computers to do, such as the runaway over the last century or so in the superiority of computers over humans in basic arithmetic. Computers and humans will continue to co-evolve with computers making the faster progress but falling far short of apocalyptic predictions of "Singularity," except to the extent that much of civilization is already a rolling singularity. For example people can't generally predict what's going to happen next in markets or which new startups will succeed in the long run. 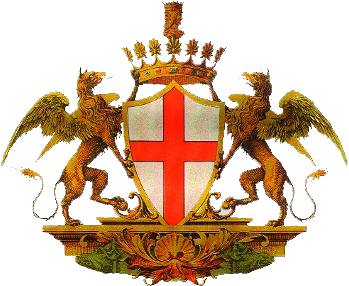 Genovese coat of arms with gryphons and cross of St. George. Genoa was the most commercially innovative city of premodern times. 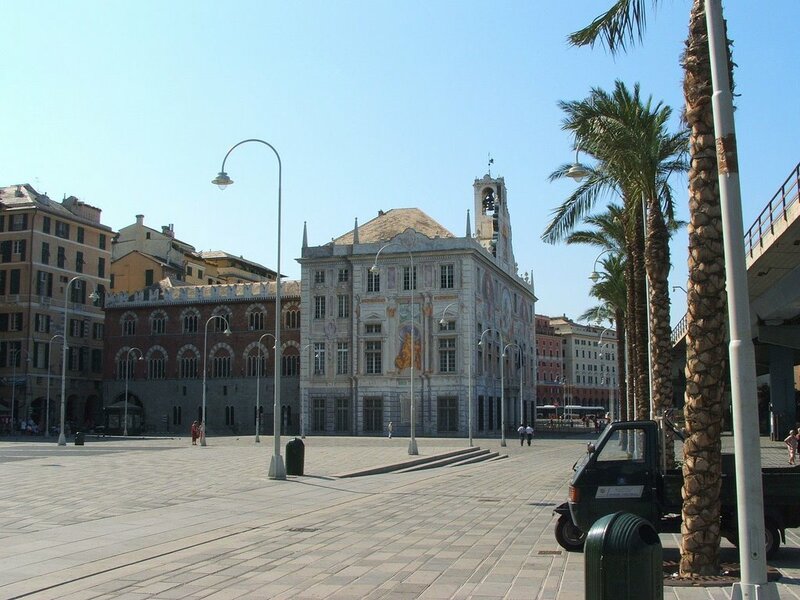 Insurance, the joint-stock corporation, close cooperation between navy and merchant marine, international trade and exploration, and banking all made substantial progress in Genoa. The basic drivers of these innovations were Genoa's merchant culture and its unprecedented commitment to freedom of contract. La Lanterna, the harbor lighthouse. 40 meters of rock and 77 meters of tower put the lantern 117 meters above sea level at the harbor mouth. The current version dates from the 16th century, but a lighthouse tower has been at the location from at least the 12th century. Genoa was probably a significant port under the Greeks, Etruscans, and then the Romans, but is not recorded as playing a major role in history during those periods. It declined in the Dark Ages but revived by the 11th century and was one of the first Italian towns to assert its independence. It played an important role in transporting and protecting crusader fleets and those of the merchants and colonists who followed. During the Crusades it gained footholds on the strategic bottlenecks of the Dardanelles and of the Bosporus across from Constantinople, giving it access to the Black Sea and the Silk Road to China. The Genovese were the chief commercial innovators of the later Middle Ages, and if anything was key to their innovations it was their advanced contract law and their commitment to freedom of contract. Nothing showed this commitment more than its long struggle against Church doctrine banning usury, which at the time meant any charging of interest. Genovese contracts "hid" interest charges as profits (which were acceptable) or in exchange rates. 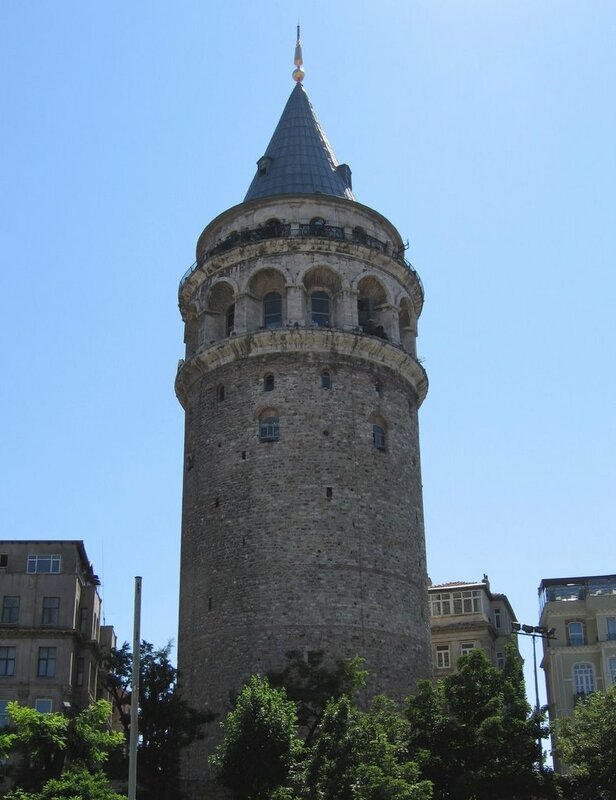 The Galata Tower, built by the Genovese on the Bosporus across from Constantinople during the crusades. Their shared control over the Bosporus opened up the lucrative Oriental trade and allowed them to plant colonies along the Black Sea. An example of the use of exchange rates to incorporate interest was the "dry loan" which structured interest as a transport charge commonly used in a "wet loan" which were normally paid off in a distant city as a way of transmitting money. Church leaders recognized many of these ruses and complained, but since Genovese municipal judges were, like the rest of the Genovese community, staunch advocates of freedom of contract, and since the Church was dependent on Genovese power (for example to transport and protect crusaders and pilgrims on the seas), the judges winked at these ruses and the Church mostly did not crack down on the practice. In the process of developing these ruses the Genovese became creative drafters of commercial contracts and learned to distinguish elements such as risk, loan, and investment that had been bundled together and treated as inseparable in previous eras. In short succession Genoa developed insurance, insurance pools secured by landed estates, and reinsurance. Exchanges sprang up for trading public debt, commodity futures, and other commercial paper. Bankruptcy law and the settlement of international trade disputes reached new levels of sophistication. Accounting became widespread and double-entry bookkeeping was born. As a result of their cumulative breakthroughs in institutions and technology, Europeans became the first merchants to travel and trade around the entire globe. Medieval Genovese merchants, like their Venetian rivals, traveled from Iceland to China. Later Genovese such as Christopher Columbus would lead exploration of the New World. The earliest risk-pooling insurance contracts were structured similarly to, and enforced under the same legal principals as, loans. Indeed they bundled a loan from the combined investor/insurer with an insurance clause -- in the event that the ship was wrecked, the loan need not be paid back. In 14th century Genoa, we see the separation of the investor from the insurer, via a contract with its conditional clause but requiring no initial loan. Investment contracts became separate entities and could be contracted with different parties, greatly improving the spreading of risk for these ventures. Such improved risk management was crucial for the explosion of overseas trade that Europe initiated over the succeeding centuries. One of the most innovative families were the Vivaldis. Frederico Vivaldi was the one of the first merchants to be insured in the new way, and we still have some of his insurance contracts. His ancestors Vandino and Ugolino Vivaldi were famous merchants and explorers of the west coast of Africa, pioneering new discoveries and a lucrative trade that would be exploited much more by the Portuguese starting in the 15th century, taking advantage of its naval control over the Straights of Gibraltar (which Genoa never clearly gained, since before the Portuguese conquest of Ceuta Muslims controlled both shores). 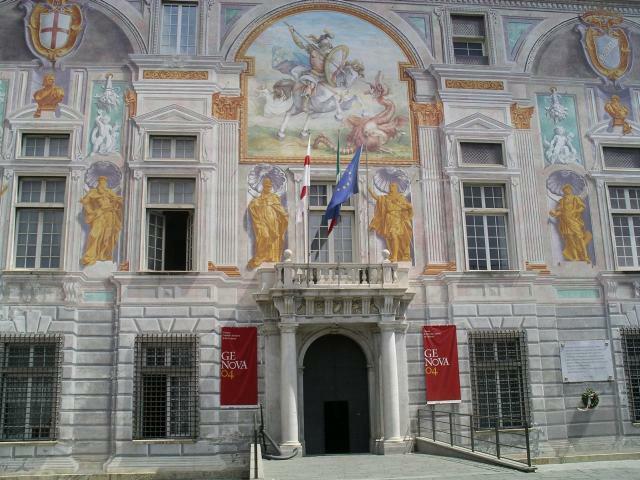 Today the University of Genoa sits on the Via Vivaldi, named after this most adventurous of families. 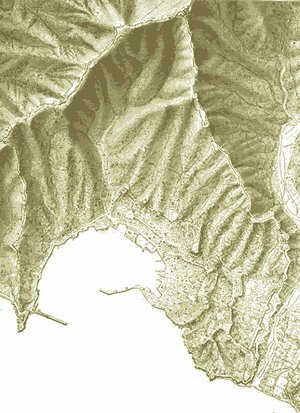 The Genoan topography helped it protect warehouses full of goods, Genoa's main source of wealth, as well as its populace. Another famous Genovese family was the D'orias. Tedesio D'Oria funded the Vivaldi brothers in their last voyage, an ill-fated attempt at the end of the 13th century to pioneer a route to India -- a feat not accomplished until about two hundred years later by the Portuguese. In the attempt they may have (re)discovered the Canary Islands, which in any case the Genovese would colonize by the middle of the 14th century. Andrea Doria was the most famous Genovese admiral, responsible for defeating the Turks in the naval battle of Lepanto, among other feats. The medieval organizations that most resembled later joint-stock corporations were the Genovese maone. These bore some strong resemblances to the publicani tax farming corporations of the Roman Republican era, although it is not clear how they could have survived the intervening Late Empire and Dark Ages other than as very obscure (and perhaps now lost) written descriptions. In form and function maone also bore strong resemblances to some early joint-stock companies such as the Bank of Amsterdam, Bank of England, and the Dutch and English East India Companies. Palazzo San Giorgio (St. George). The Bank of San Giorgio (est. 1407) came to handle most of the municipal debt, providing a prototype for later central banks such as the Bank of Amsterdam and the Bank of England. The Italian cities often sold off their tax receivables to wealthy merchants at a discount as a way to borrow funds. (Discounting was one of the many ways late medieval financiers avoided the rather lax and formalistic usury restrictions that remained in Genoa). The debts were divided into equal shares called loca or partes. Legally, these debt shares were personal property (chattels) and could be freely traded. Technically, no organization was created when the city sold its tax receivables to merchants. However, to effectively collect the taxes, the holders of loca formed an organization called a maona or societas comperarum. This organization would then subcontract to tax farmers to collect the taxes. By the fourteenth century, Genovese maone also engaged in military conquest and colonization. These were, quite literally, corporate raiders. 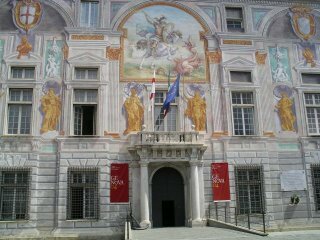 Il borsa (the Exchange). Genoa pioneered in issuing and trading shares of ships and of municipal and corporate debt. Normally, maone were temporary, but some of them ended up lasting for a long time. In 1346 the Maona di Chio e di Focea (a company for managing the taxes of Chios and Focea) was formed. This organization's members obtained from Genoa the exclusive right to collect taxes from Chios (an Aegean island) and Phocaea (a port on the Anatolian coast). But first the company would have to conquer them! Although technically a temporary organization, it lasted until 1566. Rather than going to buy receivables from Genoa, subscriptions to the di Chio e di Focea's loca shares (still legally debt, but to be paid out in dividends as taxes and trading revenues were collected) went to fund 29 galleys to conquer Chios and Phocaea. The Genovese Republic, for a fee, granted the organization exclusive rights to collect taxes from the conquered territories as well as special trading privileges. The conquests, taxes, and trading were at least partially successful, and by the 16th century more than 600 persons owned loca of this maona. This function and some of this structure would later be emulated by the Dutch and English India Companies, but with a basic legal difference -- "shares" in these later joint-stock companies would constitute ownership (like ship shares) not debt as with the maona. Genoa was limited in its naval endeavors because Muslims, and then by the end of the 15th century the Portuguese and Spanish, controlled the Straights of Gibraltar. The Genovese nevertheless supplied several leading navigators of the great Age of Exploration, including Nicoloso da Recco, Lanzarotto Malecello, Antoniotto Uso di Mare, Christopher Colombus and probably the Cabots. Its merchants also played a leading role in investing in Spanish and later English endeavors. But with the Reformation the center of commercial innovation would move from Italy to the Netherlands and England. Those innovators stood on the shoulders of giants, and the biggest such giant had been Genoa. Flag with traditional English symbols: gryphons and cross of St. George. More importantly, England borrowed and improved upon many Genovese commercial innovations, ushering in the modern era of global trade and the industrial revolution. England was strongly allied with Genoa throughout much of the Middle Ages. It is thought by some that English symbols such as the Cross of St. George and the gryphon derive from this alliance. English ships flying the Cross of St. George in the Mediterranean were protected by Genovese fleets. More importantly, England derived many of the institutions most critical to the development of overseas trade and colonies and domestic industry from Genoa. England, like the Genovese and Portugal (and unlike many other powers of the time such as China) put their navy primarily on the task of protecting its merchant marine. Its joint stock corporations, many of them colonial, derived from the Genovese colonial companies with their interests divided into shares. Lloyd's of London, with "Names" putting up their estates as collateral for reinsurance, still has the same basic structure as the marine insurance pools pioneered in the 14th century by the Genovese. One of my main interests is the history of institutions, and in particular the patterns that recur in successful institutions. These organizational structures and security mechanisms allow naturally suspicious strangers to interact with integrity. These patterns include tamper evidence, shared time, unforgeable costliness, separation of duties, the principle of least authority, risk sharing, and learning from our ancestors, among many others. These patterns have been useful for centuries, and (I can report after having spent many years working in the computer network security field) continue to be useful in the Internet era. Unenumerated is going into reruns season. For the next few weeks I will be reposting the best articles from this blog. These will mostly be posts from previous years, so unless you have been a reader since the beginning or have read most of the archives many of these will be new to you. Most blogs discuss the news or similar ephemera and for them reruns would be silly, but this blog mostly discusses issues of historical or otherwise long-term importance, and I will only be rerunning those kinds of articles. If you haven't read a particular old article from Unenumerated yet it will be as informative and entertaining today as when it was first posted. I will probably have "theme weeks" where this blog will run several classic articles on a particular theme (jurisdiction, legal/political procedure, property, contracts, money, traditional security, online security protocols, media, etc.). Hamilton then computes correlation coefficients between dollar oil prices and the euro/dollar exchange rate, finds a number of periods in which they are not closely correlated, and concludes that the dollar does not explain most of the dramatic rise in oil prices. Why do we keep seeing this kind of reasoning from supposed authorities like Mr. Hamilton? The flaw should be quite obvious, but since I've seen it mindlessly and repeatedly perpetrated by a number of professors of economics over the last few months, allow me to tediously correct it: if greater inflation is expected in both the euro and the dollar, the price of oil will increase in both euros and dollars. The euro/dollar exchange rate reflects relative monetary changes between the dollar and the euro, and the monetary component of the dollar oil price reflects absolute monetary changes in the dollar. It is absurdly illogical to expect the relative and the absolute to be strongly correlated. If the monetary changes in the euro and the dollar are of similar magnitude and direction, oil and gold prices will go up or down for these monetary reasons while the exchange rate changes little for these reasons. If European and U.S. monetary authorities are reacting in similar ways to, for example, similar credit crunches, there is no reason to expect a substantial correlation between euro/dollar exchange rates and oil prices. We will see such correlation for monetary reasons only when they are reacting with substantially different magnitudes or in different directions. In expectation terms, the euro/dollar exchange rate reflects relative inflation expectations and surprise relative inflation between the dollar and the euro, whereas the monetary component of the dollar oil price reflects absolute inflation expectations and surprise absolute inflation for the dollar. Analyzing the weekly price quotes since 2000, I get a correlation coefficient of 0.93 between the dollar price of gold and the dollar price of oil -- both absolute measures of dollar inflation expectations and surprise dollar inflation. The alternative hypotheses, changes in expectations and surprises in technological/geological supply or industrial demand, have very different effects on gold and oil that should lead to low correlations between their prices. The high correlation between gold and oil implies that oil as well as gold price changes are dominated by monetary factors. Many professional economists seem to be in denial about these basics of life under fiat currencies, perhaps since this ruins using the highly visible gas prices for simple chapter 1 lessons about how the fundamentals of consumption demand and supply by themselves are supposed to fully determine prices. These chapter 1 exercises, besides neglecting expectations, assume fixed-value currencies, and spectacularly fail for mineral commodities in our world of fiat currencies. In that world there is a monetary component to mineral commodity prices exponential in size to the expected inflation rate. This monetary component always dominates the gold price and at more than minimal levels of expected inflation (i.e. > ~2%/year) it also dominates oil prices, as demonstrated by the high correlation between gold and oil prices since 2000. [UPDATE: another thing that puzzles many economists is why oil consumption has not dramatically slackened, and indeed in some areas has still risen, in response to climbing oil prices. This demand puzzle is a problem for any theory, whether monetary or fundamental. The answer involves demand fundamentals, but does not involve fundamentals that have changed substantially in the last decade: demand forms a fairly constant backdrop for the monetarily-driven dramatic rise in oil prices; it does not itself explain the rise. The answer to the demand puzzle is that despite all the recent political sci-fi rhetoric to the contrary, oil is a superior form of energy, often with no economical ready substitutes, as well as a great chemical feedstock. Automobiles in particular give us quite valuable real options that the vast majority of us actively seek and are extremely reluctant to give up. When gas prices go up we cut back on luxuries and many other kinds of necessities to make room for greater gas expenditures. Alternatives are typically costly status items, like hybrids, that are not practical substitutes for most people. As a result the demand for oil is far less elastic than for most commodities. Furthermore, because the dramatic oil price rise of the last decade is largely a monetary not a fundamental effect, the costs of alternative energies and conservation are also inflating -- they are simply much stickier than oil prices and will thus lag but eventually catch up to them. Investments in them will turn out far worse than a mere fundamental analysis would indicate, and enough people remember the 1970s, and how tacky and dangerous the small cars everybody bought in the late 1970s and early 1980s seemed by the late 1980s, that this has made people more reluctant to buy small or alternative in the current runup. Adding to oil's inelasticity are the many countries that subsidize fuel consumption. (Here's the link to Hamilton's erroneous analysis, H/T Marginal Revolution, and my comments above were originally made at that blog, and appear here slightly edited). The first graph shows implied expected inflation based on historical weekly gold and oil prices, 2000-2008. The oil and gold prices are adjusted for an estimate of historical inflation (specifically inflation as measured by CPU-I up to the date of the price, as opposed to inflation expected after the date of the price, which these adjusted prices imply) and for a small fundamental long-term trend (see below). The absolute expected inflation is based on certain baseline assumptions, whereas the relative changes in inflation expectations are not based on these parameters but simply on the theory that the oil and gold prices reflect the net present value of expected inflation, which is an exponential function. There is a close correlation, specifically 0.93, between the weekly movements of gold and oil prices in this period. The expectations implied by oil include both monetary component reflected by this correlation as well as a much smaller component primarily reflecting differing expectations and surprises between gold and oil in industrial demand and technologicaly/geological supply. The separate oil (in gold prices) expectation graph reflects this difference. My attribution of all the differences between gold and oil to these fundamentals assumes that there has been insignificant change in the relative demand for gold and oil as money, which may be dubious assumption give the great recent rise in the use of oil and other commodity derivatives to hedge inflation in investment portfolios, and also the possibility that the security of economic property rights (i.e. effective long-term control by the same entity) in oil has increased recently faster than that of gold. But the fundamental contribution to the price of oil in terms of gold must be substantial since the graph of the difference in price expectations between the two reflects major events impacting oil demand such as 9/11(which along with the recession from the dot-com crash greatly impacted world and especially U.S. travel, reducing oil demand). A few potentially important monetary events, such as the appointment of Ben Bernanke to replace Alan Greenspan as Fed chairman, are also labeled. There is a significant increase in the both the level and volatility of inflation expectations around and after this appointment as the market tried to predict how inflationary Fed policy under Bernanke might become, and generally indicated that higher inflation could be expected from Bernanke than Greenspan. Even before Bernanke was chosen, the ballooning federal deficits after 9/11 caused a gradual but substantial increase in inflation expectations from then until the end of Greenspan's term. Over his entire leadership from 1987 to 2006, Greenspan lowered inflation expectations from about 4% to below 2%, and they then rose to about 2 1/2% by the end of Greenspan's term, and are back above 4% today. (Greenspan in his own book, The Age of Turbulence, published in 2007, says that with fiat currencies we can expect inflation of about 4.5% from here on out, a more pessimistic estimate than that probably implied by gold prices in 2007, but perhaps a bit more prescient than the market given that inflation expectations have increased to above 4% in 2008. Of course, remember that my model reflects changes in inflation expectations much better than absolute inflation expectations, so these absolute numbers are very approximate). (4) Prices on the 10-year TIPS reflect inflation expectations only over the next 10 years, whereas gold reflects inflation expectations over an indefinetely long period. If some event (e.g. the baby boomers reaching years of requiring peak medical attention, causing U.S. government deficits to skyrocket) posing great inflation risks is expected to occur within a foreseeable period of time but not within the next 10 years, this could be reflected in a spread between the two implied expectations. The second graph shows this expected versus the actual (or at least CPI-U) dollar inflation from 1968 to today. Again from the difference between oil and gold we can see some oil fundamentals such as the impact of the Asian/Russian crisis on lowering oil prices (in terms of gold as well as, in this case, dollars, as inflation expectations were also at their lowest) in 1998 and of the Iran/Iraq war which depressed oil prices in terms of gold in the 1980s (probably due to decreased security of long-term economic property rights in their oil and the need by these oil states to fund their war with limited ability to borrow). Since I generated these graphs three weeks ago, there has been a substantial and as usual correlated drop in both dollar gold and oil prices, probably reflecting an easing of the credit crunch in the U.S. and more confidence that the Fed, seeing its inflationary behavior lead to immediate and politically consequential pain at the gas pump, is less likely to use high inflation to default on current U.S. debts than was thought in previous weeks. At the same time the overt default risk for Treasuries has nearly tripled, also reflecting some new political limits on inflationary default. By the way, in the most recent week the dollar also strengthened against the euro by a similar amount, so that the explanation for last week, but not most of the previous ones, involves a monetary improvement unique to the dollar rather than shared by the Fed and the ECB. [UPDATE: here's a third graph showing implied inflation expectations derived from monthly quotes of gold and oil in dollars going back to 1974, using some different parameters than were used for the second graph econd graph. The two expectations have a correlation coefficient of 0.76. (I forgot to run the correlation with the parameters that generated the second graph, so I wanted to show the graph corresponding to the 0.76). This is still a strong correlation consistent with the long-term trends in oil and gold prices each reflecting a common estimate of future inflation -- gold and oil fundamentals are very different and so cannot lead to such strong correlation. This compared to two random walks with no long-term tendency to rise, which on average have no correlation. I have a beautful private collection of bank notes from the Free Banking Era in the United States (1837-1863). During this era the U.S. had no central bank and paper money was issued by a variety of private banks. Some was even issued by manufacturing and retail companies. This money was backed by gold, silver, real estate, stocks, bonds, and a wide variety of other assets. You can no longer cash them in, but they are now worth often substantial sums as collectibles. As you can see below, the note designs were more varied and creative than modern money, and were remarkably free of politicians' faces. Due to personal cash flow needs, I am selling some of my collection. Nobody is printing any more of this kind of money and it is a great hedge against inflation. As a collectible it is subject to less political risk than gold (recall FDR's confiscation of gold in the U.S., for example) or commodities (just watch C-SPAN to see what politicians want to do to commodities "speculators"). If you want to shop around, Google for what other people are asking. Make sure you're looking at fresh prices though -- as you might imagine, along with commodities and many other collectibles their dollar prices have risen substantially over the past year. You'll find that for most notes I'm offering a substantial discount. Please send your order or query to me at nszabo AT law DOT gwu DOT edu. To compute the total charge add $10 for shipping and handling within the U.S., $20 if outside the continental U.S. n.b. : The photos are of the actual notes you will get, next to their descriptions. (Some are a bit blurry, sorry -- I am going to try to get some clearer pics later). The notes are well protected and in the same shape I bought them, generally good to extremely fine. All my notes are hand-signed by issuers' officer(s) unless I indicate "not issued." You get your full money back (minus shipping) if you return them for any reason within 60 days. $90. Not issued. "Allegheny Furnace" is misspelled "Alleghany Furnace." I don't know if this is unique to this note, or otherwise whether this fact is good, bad, or indifferent to the value. $100. Two holes have been punched and bit of one corner has been cut out of this one, probably indicating that it is a cancelled note. Very rare. I also have a signed $1 Los Angeles Clearing House Certificate from the pre-Federal Reserve Days (1907), $15.